Why are North Carolina lawmakers talking about judicial reform, and why are they talking about it now? Those two questions were the focus of a town hall event Tuesday night at Raleigh’s Meredith College. 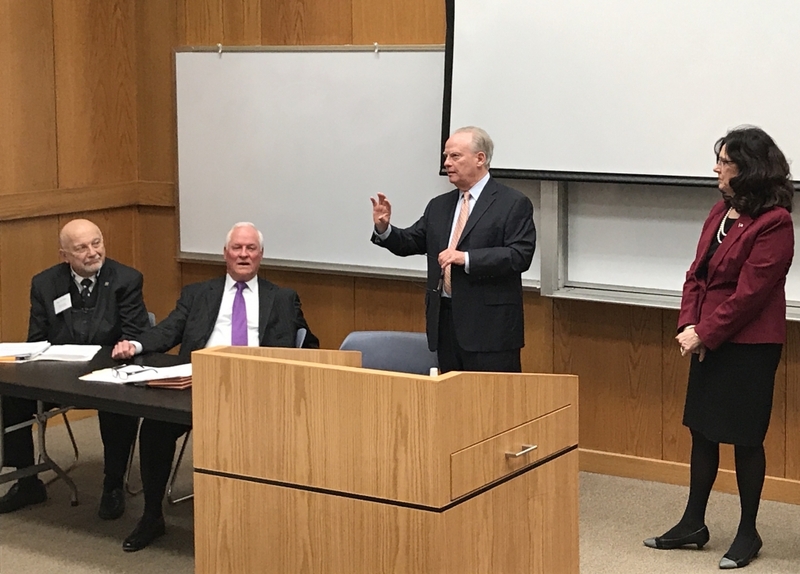 Rep. Cynthia Ball (D-Wake) hosted the panel discussion between her colleague Rep. Joe John (D-Wake), former Supreme Court Justice Bob Orr, retired Wake County superior court Judge Don Stephens and David McLennan, a Meredith professor of political science. “There is no more important issue that the legislature is considering messing with, as I call it, than the independence of our judiciary,” Ball told a room full of people. McLennan told the crowd that judicial reform in North Carolina right now is about politics. The courts have overturned 14 laws since the GOP became the majority party in 2012 and urban areas are growing, which in the long run points to more and more people voting Democratic. “It’s quite clear that a lot of this needs to be pushed through by the midterm election so the Republicans can get what they want,” he said. Lawmakers have been discussing judicial reform since last summer, when Rep. Justin Burr (R-Stanly, Montgomery) unveiled a surprise set of maps redrawing all of the state’s judicial and prosecutorial voting districts. However, they started making changes to the judiciary long before, including ending public financing for judicial elections in 2013, making judicial elections partisan in 2016, eliminating seats on the Court of Appeals last year, as well as eliminating judicial primary elections. Orr explained that there were three things driving judicial reform now: North Carolina is now a two-party state; leadership has changed and for years operated with the understanding that going to court was the only way to make a change; and redistricting. He pointed out that the state Supreme Court race in 2016 was the most expensive of its kind that year, and most of the funds were from dark money. “The only reason anyone really cares who is on the Supreme Court is redistricting,” he said. “I’m disappointed in my fellow Republicans for pushing that kind of bad agenda, but we’ve got to start coming up with some solutions,” he said. “It’s such a bad thing,” he said. Stephens called judges “the neutrals,” and said they were not meant to be political actors. The ideal way to run the judiciary, he added, was through nonpartisan, publicly financed elections. “The public voted for the best candidate, not the best politician,” he said. He and Orr put on quite the debate while they were taking questions from the audience. They went back and forth on which type of judicial elections were best and important Supreme Court decisions in the state’s recent history, poking fun at each other occasionally in jest. Ultimately, they both agreed that what the legislature is doing currently was not right for the state’s judicial system.